I have talked about vSphere 5.5 Enhanced LACP Support Design Considerations in a previous article. 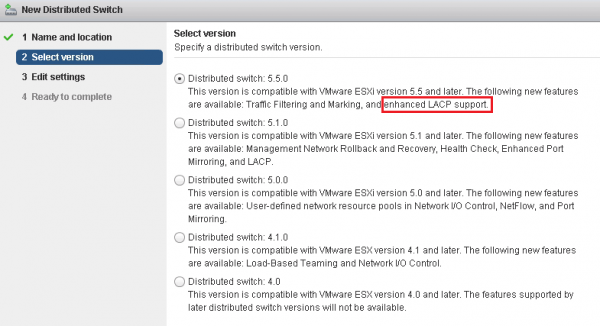 Without resuming all details of this post, VMware introduced LACP support on vSphere Distributed Switch in vSphere 5.1. LACP controls the bundling of several physical network links together to form a logical channel for increased bandwidth and redundancy purposes. Enhanced LACP Support (LACP v2) on VMware vSphere 5.5 (released in september 2013) introduced a larger set of features to improve dynamic link aggregation flexibility compared with vSphere 5.1 and addressed the gaps with competitors. However, you may end up with the LACP configuration missing in the settings of your Distributed Switch although it is already in version 5.5.0, meaning that you have only LACP Basic Support. Where is the LACP configuration hidden ? According to the VMware KB 2051311, you may find yourself in this case if you upgraded your Distributed Switch from version 5.1.0 to 5.5.0. Due to some prerequisites, the migration process does not automatically enable Enhanced LACP Support to avoid possible problems. Actually, there is a second scenario not described in VMware KB where you may end up with LACP Basic Support: if you create a Distributed Switch in version 5.5.0 with the legacy vSphere Client (instead of Web Client). 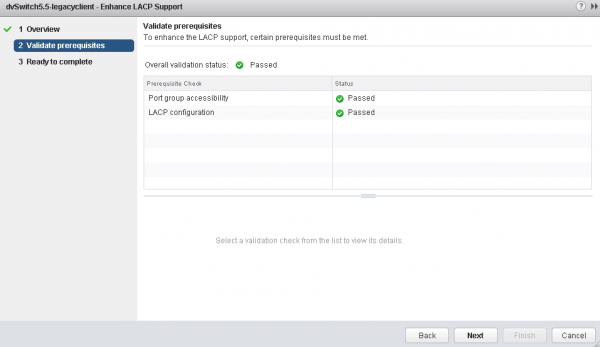 vSphere 5.1 only offered a basic implementation for LACP, with a lot of limitations and constraints. 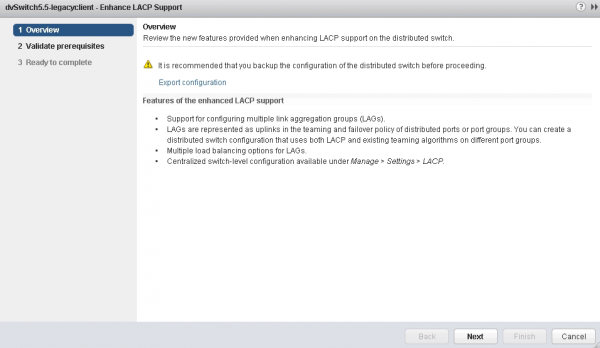 When the switch is upgraded to version 5.5.0, you need to convert to the Enhanced LACP Support to create multiple LAGs on the Distributed Switch. In the screenshot above, we have a Distributed Switch 5.5.0, and the Enhance link launches a wizard that will convert to your LACP Support to Enhanced. Once the process is completed, you can manage the Link Aggregation Groups (LAGs) in ” Manage > Settings > LACP “. This is the second scenario where you may only have LACP Basic Support. To be able to create multiple LAGs on you Distributed Switch, you must go through the same migration process as the one abovementioned. Note: if you have trouble to convert to Enhanced LACP Support on your Distributed Switch, you can have a look at the KB 2051321. Somehow in my lab I ran into this despite my environment never having been 5.1 – maybe I did a key step in the older faster client. After I enabled enhanced LACP I then had to go in and manually add my pNICs to the LAG and make the LAG active while pushing the (now without NIC) uplinks down to unused. Bashed my head against this for a while too. I created my vDS monts ago with the legacy vSphere Client not knowing that this is wrong. 🙁 I never used LACP and want to convert the vDS to enhanced LACP support now. Unfortunately i have not found any information about what impact this conversion has on my existing network configuration. Will there be any interruption that is noticeable? I already did the prerequisite check on my vDS and everything is ok.
Is this conversion in my case just a database flag and nothing happens on my hosts? first, I don’t know in which version you are, so I’ll assume vSphere 5.5. 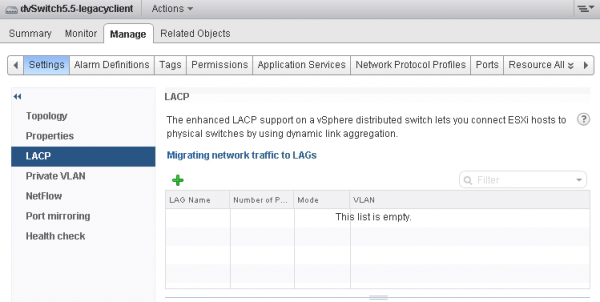 If you are not using LACP at all for the moment, the conversion of the VDS will not have any impact on your network configuration (it is indeed just a set of features that are enabled internally in the distributed switch). However, you still have to create a LAG if you don’t have any and modify the portgroups configuration. Have you seen my other post with more information on Enhanced LACP Support? Wow – thanks a lot for your quick reply!!! And sorry I forgot to mention that I´m on 5.5 U3a at the moment. We have HP C-Class Blades with Cisco Nexus FEX. What concerns do you have with a blade configuration? about your blade with LACP question. LACP is not “as simple” as a rack server implementation because each blade system have it’s own network solution: sometimes pass-thru, sometimes normal network switches, sometimes simili switches (such as HP Virtual Connect) or converged infrastructure, etc. ok, this is your concern. We are aware of that fact and our network guys know what they do.